Influenza (the flu) is a disease we are all familiar with. Most of us have experienced the misery of being cooped up in bed with a temperature, but sometimes influenza can also cause serious complications, particularly in the elderly. It can even lead to death. You might think that understanding influenza is a task for medical researchers, but it turns out that a mathematician’s ability to look at problems in a fresh way and ask the right questions can be very useful. 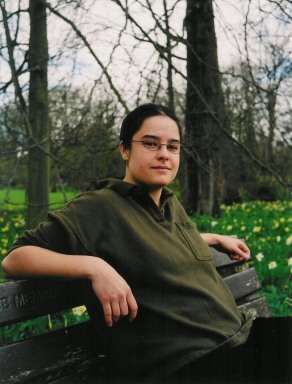 An example is the mathematician Julia Gog, head of the Disease Dynamics Research Group at the University of Cambridge. 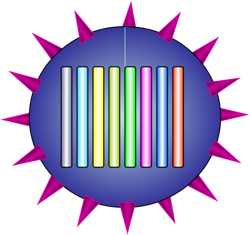 A diagram of a virus particle showing the eight segments inside the genome. During a flu infection, viruses spread from cell to cell. They use those cells to make more copies of themselves. The genome of the the most common form of flu virus is made of eight segments. When the virus makes copies of itself the eight segments are replicated separately, but must end up together inside a new virus particle. A virus needs a full set of segments to function properly. 8 x 7 x 6 x 5 x 4 x 3 x 2 x 1 = 8! = 40,320. So the chances of picking a complete set at random is 8!/88 = 0.0024, or less than 1 in 400. So is collecting segments at random any good? No, because less than 1 in 400 virus particles will function properly. The virus could do better by collecting more segments, in order to make sure it gets the full set of eight. This approach reminded Gog about collecting Kinder Egg toys: how many Kinder Eggs do you need to eat in order to get a full set of toys? The answer is, a lot more than there are toys (this is something many of us have explored experimentally)! Gog calculated that the virus would need to choose 22 segments on average, to collect the complete set of eight. It turns out that influenza doesn't get around the problem by simply grabbing more segments. Maths can be more fussy! What about if, instead, the virus was a bit less random? Experiments suggests that the virus has some way to ensure that it has exactly one of each segment. We don't yet know exactly how this happens, but it’s thought that there is something about each of the eight segments that acts to distinguish it from the others. Gog and her colleagues at the Disease Dynamics Research Group are trying to find where these differences are on the genomes of each segment. They are analysing the patterns in the genomes to pin-point suspicious regions, which can then be explored by Gog’s medical colleagues. Finding new ways to use maths in an unexpected place could give us a defence against future pandemics. This article is based on a slightly more advanced article that first appeared on Plus magazine.